Accented letters (dead keys) stop working fine in KDE apps after navigating through menu bar's. When typing in the text area of KDE applications, the keyboard (with dead keys) work fine, but if you access the (classic) menu bar in the application window, dead keys may stop working fine. Press key "´" and "A", expected output= "á"
- With widget Window Menubar no problem. - In Rekonk, with menu system like Chrome, no problem. 1º Check that you are using a keyboard layout with dead keys, if not, install and use one. 3º Write something to check that dead keys work well. In English, e.g. 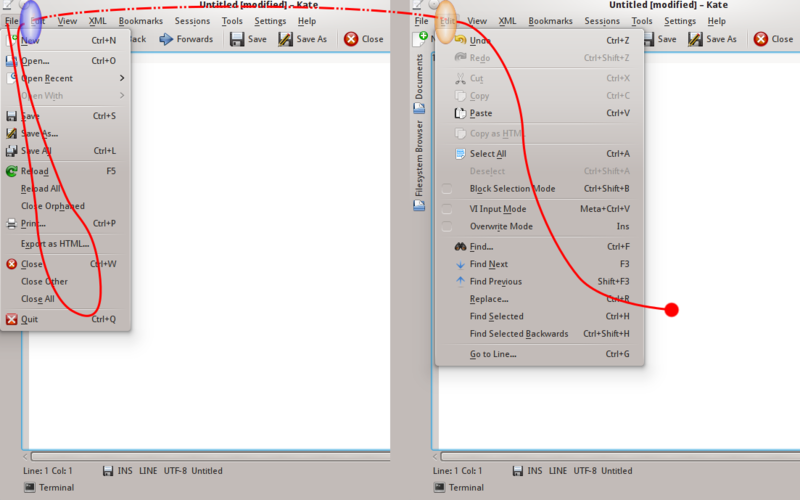 press "´" and "A" results in "á"
4º Access of the menu bar in the application window and scroll through the options. Scan down the File menu. Scan up back to "File" nenu. and leave the menu on the side. 5º Write something to check that dead keys work well. 6º If dead keys fail, change the focus (e.g. another window) and return to kate, dead keys work again. Tested in Debian, kubuntu (13.04, 12.10, 12.04), OpenSuse. Tested in installed system and live-cd. If this bug is not resolved, please, the Kubuntu 13.04 release with widget Window Menubar be default. Another way (with keyboard) to cause the failure. I had the same problem on Kubuntu 14.04. Installing scim and removing ibus seemed to fix it. Still testing.